This week we’re going to talk a lot about nourishment. Many of us have been starving ourselves for years. Starving for good food. Starving for spiritual enrichment. Starving for beauty. Starving for love and starving for acceptance. Part of the journey towards self-love and acceptance is making sure you have enough nourishment. And for today, we’re going to talk about food. As you may have guessed I’m not a big believer in diets. They tend to be short-term. They don’t last. And in the long run, they don’t work. So I don’t think you should go on a diet. But I do think you should focus on nourishing your body with good food that has a lot of healthy stuff in it. And when it comes to good food with healthy stuff, I have to recommend one of my favorite Thai soups called Tom Yum Goong. Honestly, the fact that this soup is good for me, is just a side benefit in my world. I eat it because I love it. The fact that it’s healthy, well that’s just a bonus. By the way, in learning to pronounce this soup, I always remember that all 3 syllables rhyme with “boom” because that’s the effect it will have on your mouth. After one taste, your mouth will go “boom”! This soup is SPICY. If you ordered this in Thailand and ate it the way the Thai people do, it would probably blow your head right off. Some of that red stuff floating on the top of the bowl in the picture is pepper. But it is also healthy and flavorful. And there is simply no better remedy in the world for a stuffed up nose. When I get a cold, I head right to my favorite Thai restaurant and I’m sure to carry a whole package of tissues, because all of that capsaicin in all of those hot peppers will get your nose a runnin! It’s also great when it’s cold outside as it will warm you up from the INSIDE. I’ll include my favorite recipe below. But you may want to try it at a local Thai restaurant first to get an idea of how it should taste. Note: the first time you order it, let the waitress know that you are new to the experience and ask her to have them make it mild or not too spicy. Most restaurants are happy to adjust. If you love it, you can ask them to make it spicier next time. Bring 4 cups of water to a rolling boil. Peel the shrimp, leaving tails intact and reserving heads and shells. If you have heads and shells, add them (but NOT the peeled shrimp themselves) to the boiling water and let it simmer for about 15 or 20 minutes. (Don’t say ewwww. It will make your soup taste a lot more awesome!) After 20 minutes carefully strain out solid ingredients and put liquid into a clean, non-reactive pan. 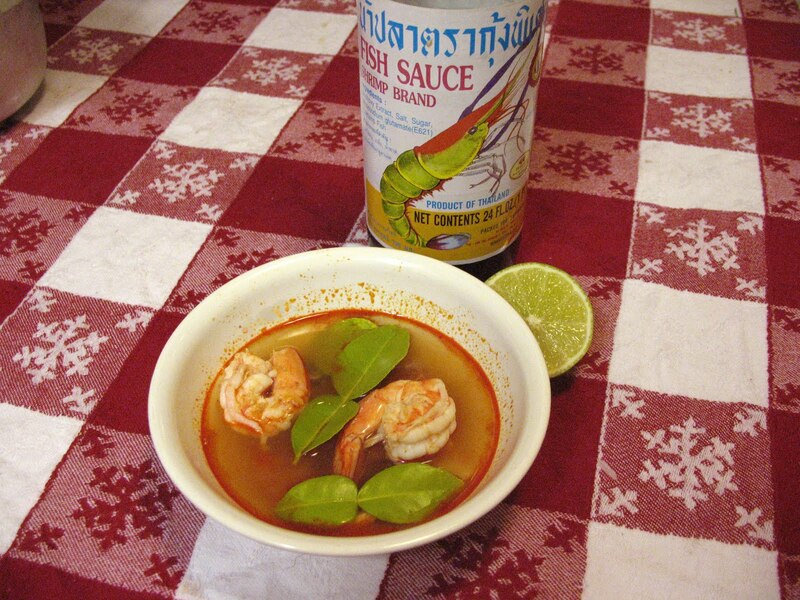 Bring liquid back to a boil and add 1-2 tablespoons of the tom yum paste. Try 1 tablespoon at first. You can always add more later. Be CAREFUL with this stuff, it’s like molten lava. Be careful not to touch your eyes or your face until you’ve had a chance to carefully wash your hands. A gentleman friend of mine didn’t heed this advice and stopped to, um, go pee halfway through the cooking process and had a VERY uncomfortable half-hour after that. Okay, hands washed? Now add the salt, lime juice and ginger pieces. Simmer for about 10 minutes. Add the tomatoes and simmer for about 2 more minutes. Taste it. Add more lime juice (sour), fish sauce (salty) and tom yum paste (heat) until you’re happy. Now bring the liquid to a rolling boil and then shut off the heat. Add the shrimp and mushrooms and stir until shrimp are pink and opaque. This ensures the shrimp are not overcooked (and rubbery–yuck!). Pour into a bowl, sprinkle some cilantro and or kaffir lime leaves on the top and chow down. I like to serve this with plain jasmine rice. Some folks like to alternate between bites of soup and bites of rice. I usually just dump some of the rice right into my soup bowl. One more note, it’s helpful to serve this soup with a little empty soup bowl or plate on the side. The ginger coins, shrimp tails and kaffir lime leaves (if you actually found them you little foodie you) are for flavor and are NOT MEANT TO BE EATEN. Just delicately spoon these out as you eat and put them on the side. Don’t let all the warnings freak you out. This soup is awesome and you’ll get the hang of it in no time. Enjoy and allow it to nourish your body and your soul.